If you’ve received one or more “Package file is invalid” error when downloading from the Google Play Store over the past few days you’re not alone. The issue seems to be a result of corrupted data coming from Google’s servers itself, so users can do nothing about it. Placebo fixes, such as clearing the Play Store cache or uninstalling and reinstalling the app, appear to be working sporadically, but it’s mainly because the issue is only affecting a small number of Google’s servers. 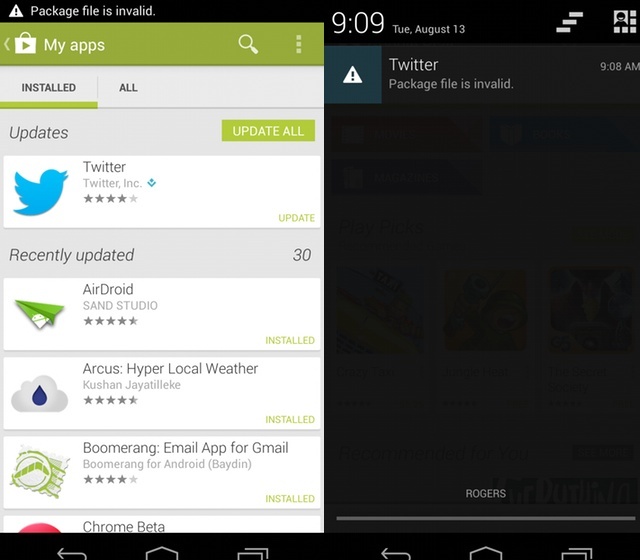 For example, the new Twitter 4.1.5 keeps giving a “Package file is invalid” error when downloading, but most other apps are fine. The issue should clear in a few days, but Google has not stated an explicit reason for the issue.